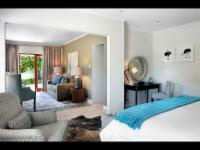 Tucked away in the breath-taking Franschhoek Valley, Residence Vive la Vie offers a quiet reprieve from hectic city life. 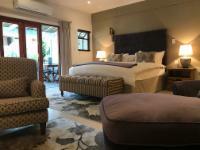 Picturesque Franschhoek stole owners Harald and Johanna Neumann’s hearts back in 2012, culminating in them purchasing the property and encouraging all who come through its doors to “Live Life”. Stunning mountain and garden views help your stresses melt away as you admire the surrounds from your private patio, glass of wine in hand. The sparkling pool is the perfect place to cool down on a hot summer’s day, while the town’s centre is a short walk away with all its wonderful shops, galleries, museums and famous restaurants. Escaping here for some peace and quiet can be exactly what you need to leave feeling refreshed and rejuvenated. 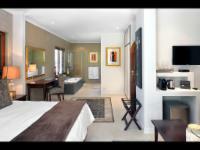 Five tastefully decorated suites offer all the comforts of home, including a Nespresso machine, DStv air-conditioning. The artwork of local artists adds a distinct South African flavour to the spaces, something that combines beautifully with the elegant country atmosphere throughout. Mainly neutral tones bring a sense of serenity, with bursts of colour here and there inject life into the overall setting at the same time. Glass, Perspex, wood and a variety of textures help to create a guest house that is the epitome of modernity meets relaxed, country luxury. The wooden shutters across the front of the property echo its farm roots. Enjoy delicious breakfasts in the dining room that opens onto the outdoor terrace and relaxing afternoons spent lazing in the communal lounge. There are numerous activities available in the area as well, from wine-tasting to hiking, horse-riding and mountain-biking. Get on Settlers Way/N2 in Crossroads from Borcherds Quarry Road/M22 heading northeast, slight left towards Michigan Street. Turn left towards Michigan Street, then after approximately 120m turn right onto Michigan Street. After 350m turn left onto Borcherds Quarry Road/M22 after driving for approximately 700m use the left lane to merge onto Settlers Way/N2 via the ramp to Somerset. Then after 3.4km take Exit 22A towards R300/Bellville and merge onto Kuils Rivier Road/R300 drive for 14.0km and merge onto N1 towards Paarl. Take Exit 47 towards Stellenbosch/Klapmuts/Wellingtong then follow Klapmuts- Simondium Road. Turn left onto R44 for approximately 1km then turn left onto Klapmuts-Simondium Road. Drive for 8km then turn right onto Franschhoek. Drive straight for 17km and turn left into Uitkyk Street.